Butter toast as you usually would and sprinkle each piece with cinnamon and sugar. 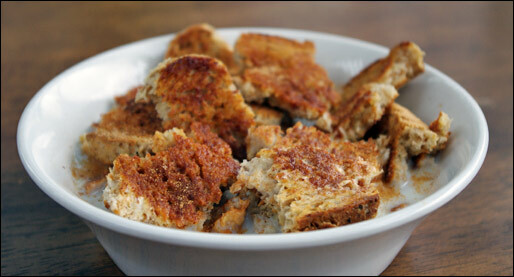 Tear the toast into bite-sized pieces and place in two cereal bowls. Pour warm milk over toast pieces. Add butter to boiling milk; mix flour with cold milk and stir into hot milk with salt. Pour over toast and serve hot. Some like milk toast sprinkled with sugar, others prefer salt and pepper; or a little grated nutmeg may be sprinkled over the top. 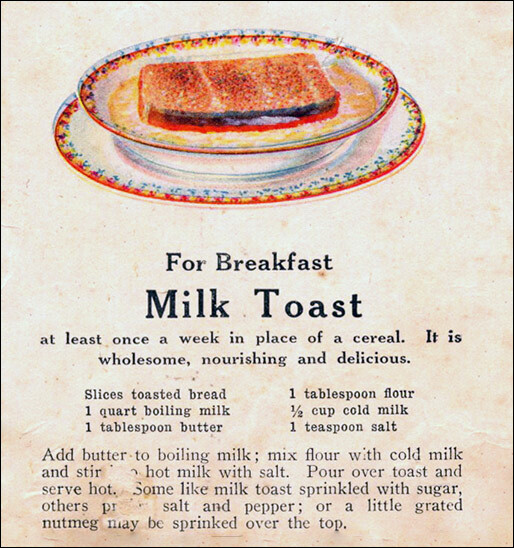 In the early 1900s, Milk Toast was popular fare for children and the ailing. It is still popular today among poor families and singles. Recipe number 148. Submitted 4/29/2002.